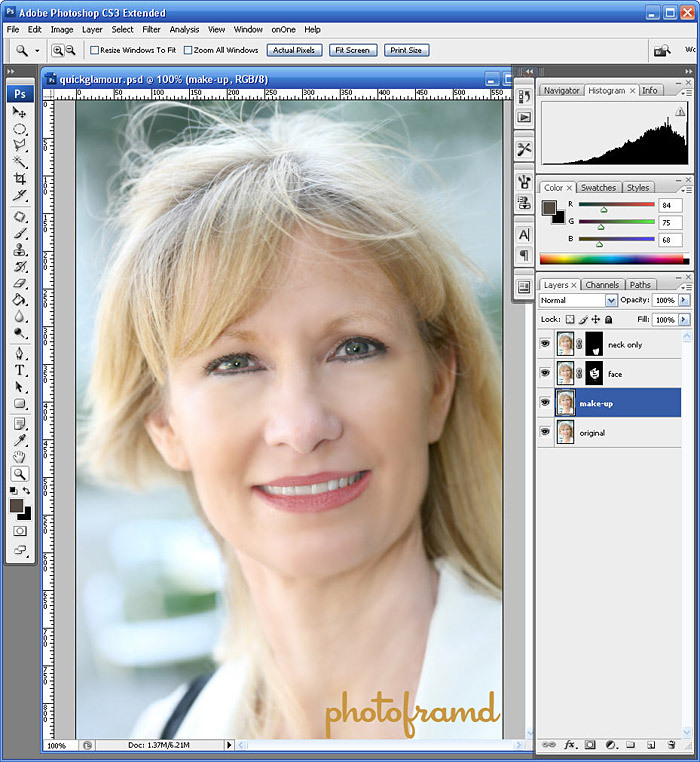 Photoshop has become synonymous with retouching photos. There are special plugins which are dedicated to handling portraits. 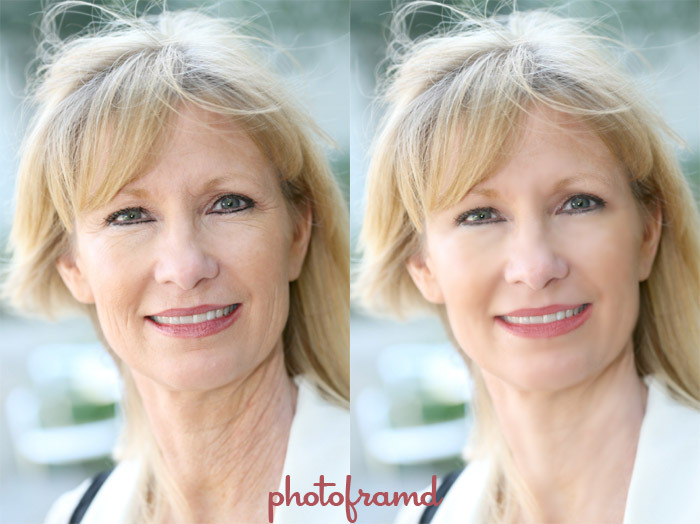 But, for some simple retouching, all you need is 5-minutes in Photoshop. The above is an active older woman with some make-up issues. Well, we can help her with a few quick steps. The Before and After shows the transformation. Pretty impressive results using only Photoshop. Take a look at the below screen shot from my Photoshop work file. Duplicate the original layer and rename it “face”. Add a layer mask to this layer and fill with pure black. Select the Brush Tool with a 65 pixel and 0 hardness. Select pure white paint. Selecting the layer mask, and start painting away the wrinkles. By painting on the layer mask, you will start to reveal the blurred smooth layer. But, be careful not to paint over areas that we want to keep sharp (like eyes, edges, teeth, etc.). Adjust the size of the brush for tighter areas around the eyes, nose and lips. Duplicate the original layer and rename it “neck”. Select the Dodge Tool for Midtones with a brush size of 65 pixel with 0 hardness. Use the Dodge Tool on the neck to balance out the color tone on the neck. Don’t work about the deep wrinkles just yet. Apply a Gaussian Blur of 4 pixels to it. Deeper wrinkles requires more of a blur. Selecting the layer mask, start painting away the wrinkles on the neck. Remember, some wrinkles are natural and will help the overall “realness”. Duplicate the original layer and rename it “make-up“. The lipstick need touching up. All we want to do is lighten the dark colors to balance out the lipstick color. Using the Color Picker, select a medium pink from the lips. Select the Brush Tool with a 30 pixel and0 hardness. Change the Mode to Lighten and paint the lipstick. Adjust the size of the brush to fit the smaller areas. Next, the black mascara is too dark. Select the Dodge Tool with a small soft brush (10 pixel and0 hardness), with Range of Shadows and Exposure of 25%. Brush over just the mascara to lighten the color and soften the black. If you feel the overall effect is too much, you can easily reduce the effect by changing the layer Opacity. By using separate layers, you can adjust the effect of each layer separately.